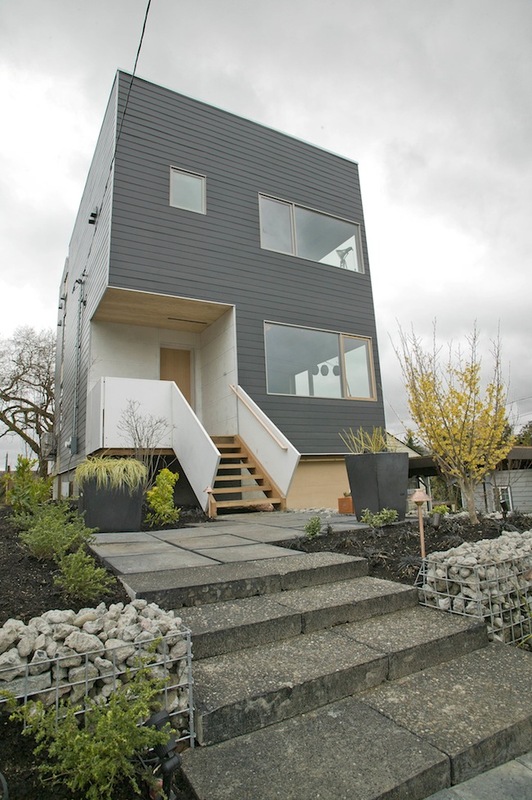 I recently mentioned the construction of Greenfab‘s model home in Seattle, and that home is now complete. I think you’ll agree, it’s just as warm and handsome as the renderings. The six-module abode — on target for LEED Platinum and Built Green 5-Star certification — has 1,790 square feet with three bedrooms, two and three-quarters bathrooms, a separate mother-in-law space, a planted rooftop deck, and an urban chicken coop. 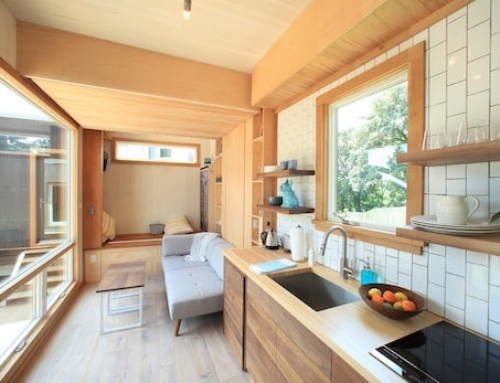 The prefab is located at 1827 S Lane Street in the Jackson Place neighborhood of Seattle. Owner, project architect, and general contractor, Robert Humble of HyBrid, will take the keys soon after Greenfab gets some time to share the new home with the community. The home left Guerdon Enterprises’ factory in Boise about 60% complete in December 2010. Altogether, it was built in a factory in five days and finished on-site in 45 days. Johnny Hartsfield, owner of Greenfab, told Jetson Green that his company has the ability to deliver homes up to about 90% complete but wanted to handcraft some aspects of this first home to make it special. 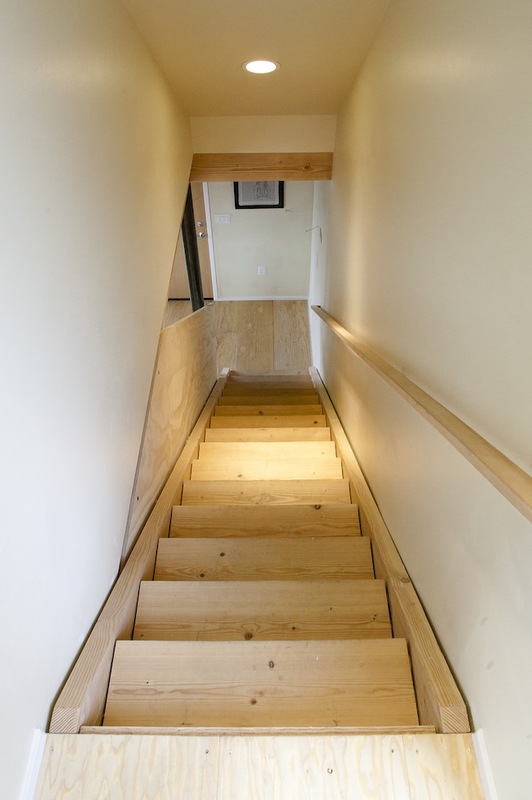 For instance, you may notice custom-milled, polished, wide-plank plywood floors below. 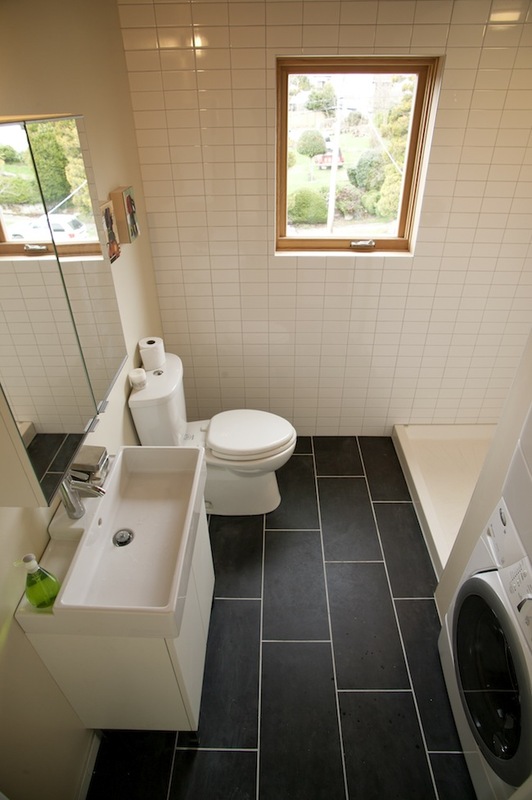 Also, Greenfab enlisted the help of Greenhome Solutions for EcoTop counters on IKEA cabinets and recycled-content tiles in the bathroom shower. Greefab recycled existing concrete by filling gabion baskets to create a custom retaining wall system. These landscape walls sport a contemporary look and seem to be growing in popularity in the residential context. To save water, a 1,400-gallon tank harvests rain for on-site irrigation and toilet flushing, while three 300-gallon basins filter and treat shower, sink, and washing machine water for landscape usage. The home has one of the state’s first grey water systems. It’s all-electric and outfitted with a Fujitsu mini-split heat pump, GE Hybrid heat pump water heater, energy recovery ventilator, Convectair backup heating, and energy-efficient appliances. In the future, a 2.4 kW photovoltaic system will be installed to offset about 23% of annual energy consumption. 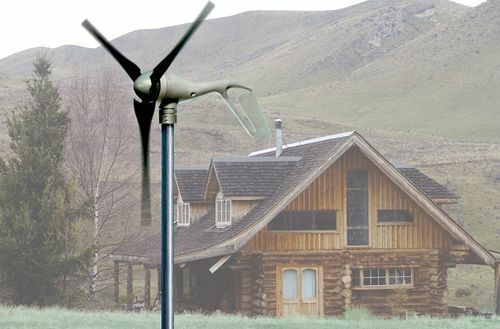 In order to approach net-zero energy levels, the system needs to grow to a size of roughly 6 kW. Hartsfield, reflecting on the project, said modular construction offers some undeniable pluses. 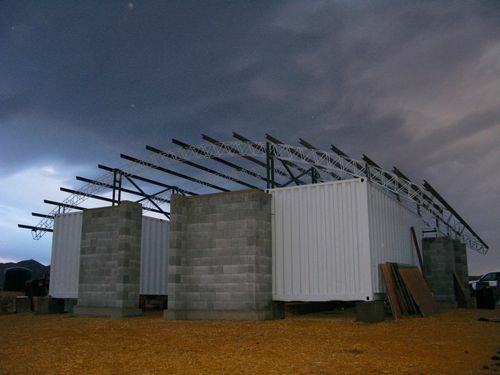 Benefits include timing (do site and factory work at same time), material integrity (keep the home secure from weather prior to completion), quality (build on jigs for strength and precision), and conservation (control to minimize construction waste). Nice! 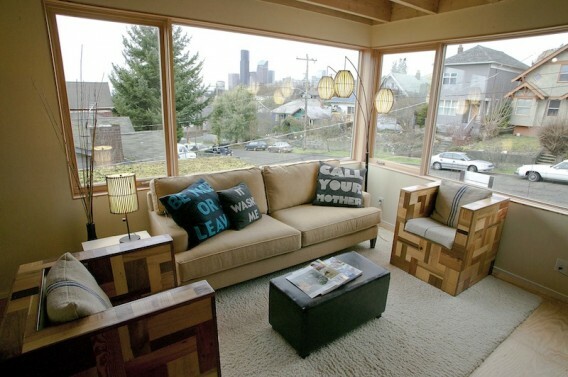 I saw those boxy looking chairs in a local eco shop last time I was in Seattle. 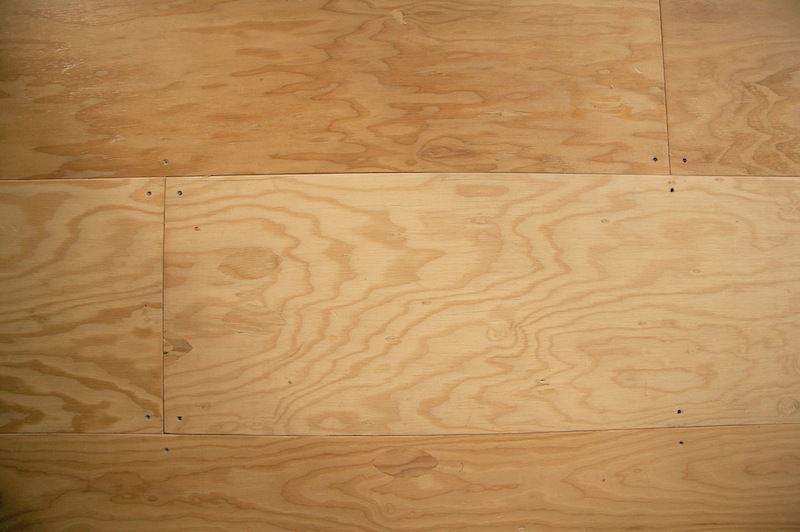 @Justin, the plywood flooring and finish was a request by the owner/architect. 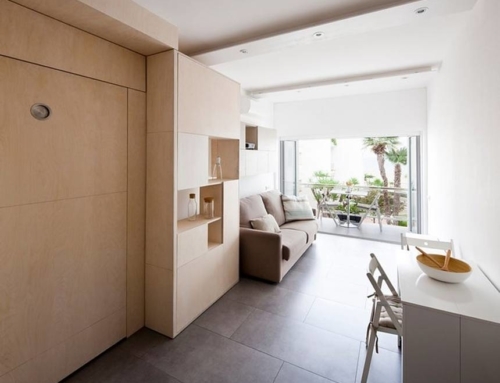 The overall concept of the home details was to maintain a rough and raw feel throughout. 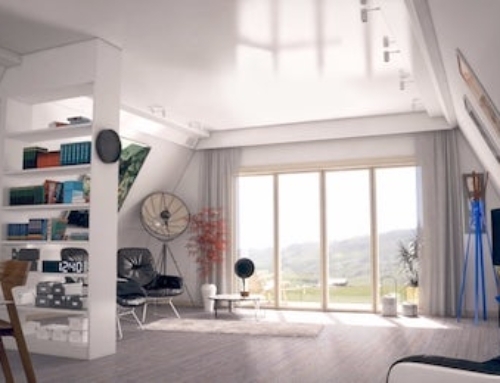 Other examples are exposed bolts, hangers and beams. 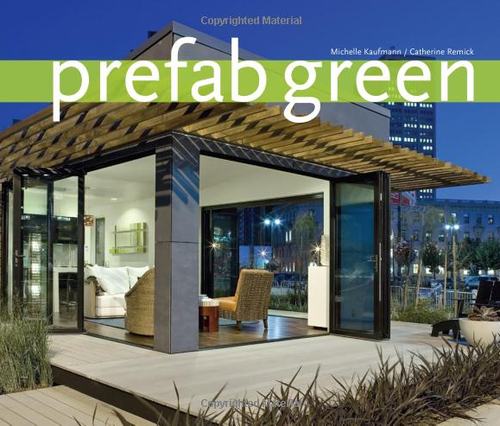 Alternatively, Greenfab homes can be more smoothly finished to meet different aesthetic needs. @Jesse, yes, the boxy chairs and a few other pieces in the home are from @nube green, a sustainable design and retail store. They were kind enough to loan us much of their showroom for our open house. Check out the Greenfab facebook page for more photos. Since it rains a lot in Seattle, I’ve always wonder why more homes aren’t built with the ability to capture rain water for on-site irrigation, etc. Since it rains a lot in the Pacific Northwest watering needs are low, and water is relatively cheap. There isn’t a lot of economic incentive to do onsite water, other than the cool factor. And the sewer system needs the gray water flow to keep working. San Francisco has discovered that reduced grey water flow has turned into a plumbing stink. Already over $100 million has been spent upgrading the system and yet sludge continues to back up in the pipes–said Tyrone Jue, spokesman for the city Public Utilities Commission. Parts of the City continue to suffer an ofor problem, particularly in the dry summer months. It seems a system designed for 7 gal/flush toilets won’t work effectively on 1.6 gal/flush toilets; diverting grey water to irrigation will only compound the problem. @ Jezebel’s Master, Sustainable design should not be side tracked because building methods long ago are outdated and wasteful. But can’t grey water also solely be diverted to flush toilets and the like and leave irrigation be? I had assumed that that was what they were up to. Also, in the SF Bay Area, the stanky sewage treatment is overburdened & projected numbers for population influx are pretty massive… correct me if I’m wrong (anyone) but it sounds like the SF Area needs a smarter/greater use of greywater for waste treatment & toilets- simultaneous to smarter permeable pavement (or the diamonds in the drive above that lets water soak in instead of run off/garbage to the Bay) and planting of appropriate landscapes, ie: not to divert the rainwater to flourish silly velvet green lawns & sorely geographically ill-planted/thirsty eucalyptus (time bomb/next firestorm) trees? It simply sounds to me that -pardon the term here- that the baby is being thrown out with the rainwater, an all or nothing reaction instead of being smarter and decisive with what tools we have? 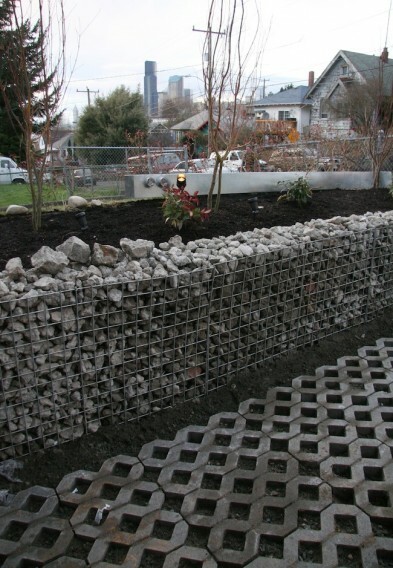 Rainwater harvesting is complicated in WA state due to water rights. In 2009 the Department of Ecology released an “interpretive statement” saying a “water right” is not required for rooftop harvesting by homeowners, but the water rights laws are not clear on the issue (there is work going on to get them changed/clarified). The total amount of precipitation in Seattle isn’t actually that much per year (about 36in per year, on par with New York City for example). Having said that, it should be plenty for landscape watering and grey water use. It is nonsensical. The ‘green’ movement. The word: green – is merely a marketing ploy. The corporate world hucksters began a vast marketing scheme to subvert what would have been, and should have been.. a very strong focus on infusing our decrepit country with a massive dose of living logically. This silly box that they masquerade as a ‘house’ – is nothing but a pile of lumber. Sticks of organic material. It rots. It is termite food, and is a bonfire waiting to be lit. Concrete, glass and steel are the answer. After all.. you won’t catch the greedy pigs that hustle the trash upon the public, building THEIR office buildings by cutting down the.. GREEN trees..! Totally agree with Starfire. This nasty grey box passing itself off as a domicile. Did any body notice the the “retaining” wall is already sagging. Good ideas, but it looks like a kindergarten art project. Some poor shmuck is probably going to pay way more than it is worth because it has the green LEED label. Probably not since the architect is also the owner. WOW: the Architect!! Okay, this sort of all just came together in my head so excuse me for being comment-abundant. The owner -he’s of Hybrid Architecture? I LOVE THAT COMPANY! Way back when they created C320 Studio, I was head over heels/wanted to bring flowers- overly taken even with the thought of inhabiting that very one, off in the woods. (Hermit!) It’s my dream house. I wouldn’t even want to pretty it up, though if pressed I could see painting the crimped exterior metal cladding, something blendy. I currently reside at the kindness/best friend’s good will in her ‘half remodeled’ 1920’s Craftsman 2-3 BR & if I could replace the totally messed up wee granny unit in the back with a CargoOffset Pair as they did, I would die of the happy. 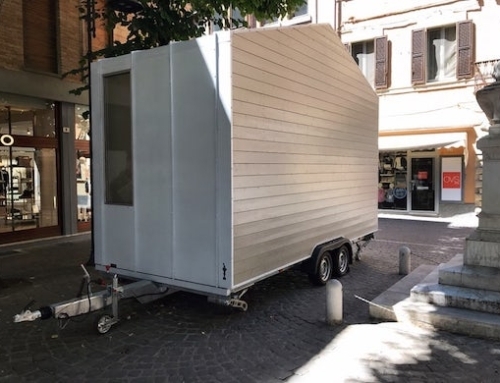 Sadly if I ever were to build, I’d have to have it be portable, small- so I could move about- and O much much cheaper. 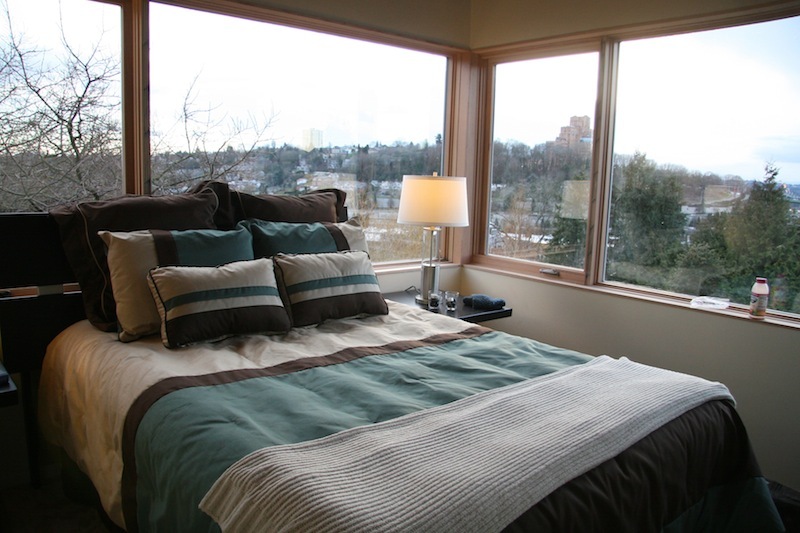 I’m allowed to stay here because my medical costs are just so phenomenal-income not matching, yet I feel guilty: I’d like to finish out the kitchen and such so that she could rent it for a nice sum when I’m able to vacate. 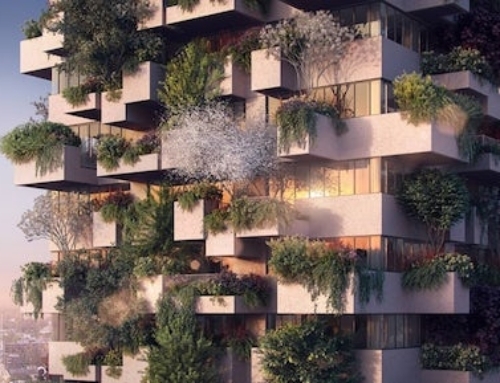 For the folks who say this design looks familiar, THAT staircase design leading up to a tall box shape happens to remind me of housing made for the people somewhere in Chile – Quinta Monroy Housing; anyone remember that look? It was Elemental Architecture, Alejandro Alevena. Not as refined, naturally, but the basic outline is interestingly like a cousin, once the upstairs tenants filled in the empty, side space with INGENUITY, and concrete block, etc… these stairs are not something that was in the original Greenfab/Seattle renderings- that was probably cables, so the end was probably an easy, fast, less expensive and cool way to go. Reading on your stairs? No blustery wind! Okay, actually the solidity and white really brought in a great presence and contrast to the grey. Cables would have been lost utterly. Hmm this design looks very familiar to me. Greetings! We are from EG Groups Holding Sdn Bhd from Malaysia. We are having a magazine called REX Review. 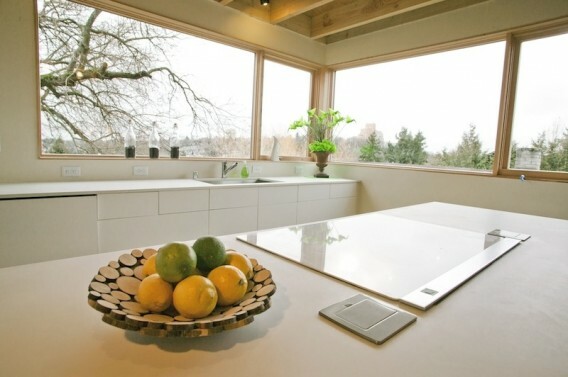 We would like get the article, Stylish Greenfab Home Unveiled in Seattle from you to insert in our REX Review Magazine. This magazine will be published in April 2012 and will be distribute in Starbuck Cafe Malaysia & Ikea Malaysia. It is about the Renovation and Property. Please do not hesitate to contact us at [email protected] or +6016-3318655.